While we often refer to “roasting” technically we no longer use open fireplaces to cook our food. Baking your beets is the best way to way tobring out the beet’s sweet flavour. This method also saves your hands and kitchen counters from the stains of beet juice. Baked beets are often served alongside meats so you can make at the same time in the oven. Set the beets aside until cool enough to handle. 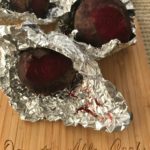 You can now easily remove the skin and protect your hands by holding each beet in a paper towel and rub the skin away. If it doesn’t come off easily you likey need to bake the beets a bit longer.